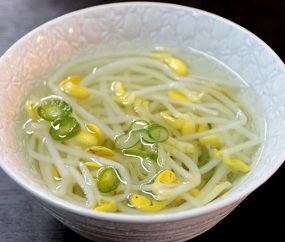 Kongnamulguk is a refreshing Korean soup primarily based on soybean sprouts, some minced garlic and scallions which is cheap and easy to make. It is considered to be light and healthy, containing full of vitamin C and low in calorie content. Very much similar to bookuhguk, this soup can be a great ailment for hangovers as well as colds. For spicy food lovers, splash of red pepper flakes (gochugaru) can be added to add some kick to the flavor. Thoroughly wash soybean sprouts and drain water thereafter. Remove any bad parts and trim roots, if desired. In a pot, sauté garlic in soy sauce and sesame oil over medium heat for 2-3 minutes. Add water, salt, soyean sprouts and bring to a boil over high heat. Reduce to low heat and simmer for 15-20 minutes. Make sure to cover pot and try not to remove lid as the flavor will spoil. For spicy version, add gochugaru 5 minutes before turning off the heat. Chop and garnish with scallion before serving.